Socioeconomic condition survey: Initial survey on the utilization of mangrove and other natural resources was carried out. Accordingly, the mitigative measures to reduce the pressure on mangrove area by cattle grazing and local people were chalked out before raising the mangrove plantation in the densely populated coastal area. Land preparation: For mangrove plantation, fish-bone canal systems were developed to facilitate inundation of sea water where ever the tidal flow was disturbed due to topographic conditions. 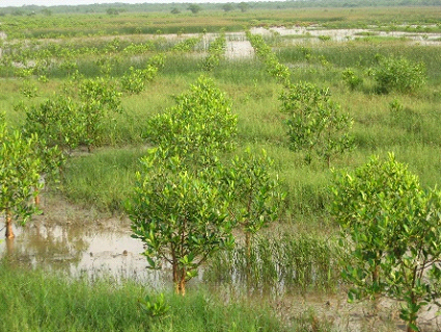 The mangrove species were planted on the slope of the canals. Plantation establishment: By selecting appropriate species based on the frequency of tidal inundation, plantation activity was achieved. 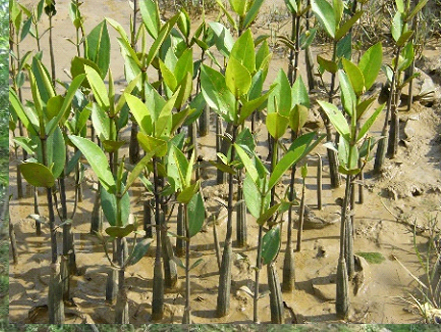 The plantation was done using either potted seedlings or hypocotyls starting from the area closer to the low tide line. Land preparation: In the area facing to the sea, palisades were placed parallel to the coastline to arrest the sand drift and to form sand dunes. The sand dune will be formed not only as the protection for planted seedlings, but also to act as a breakwater against tidal waves. The sand dune is maintained at one meter high or more before stabilized by creepers. Plantation establishment: In order to strengthen the function of the plantation to diminish tidal waves by cyclones and tsunamis, mixed plantation will be promoted. In between the casuarina, species like Pandanus spp., Prosopis spp. will be planted to develop the multi-layered and multi-species forest, which is more resistant against the damage by wind, diseases and insects than the current mono cultured casuarina forest. Cashew trees will be also promoted to augment the incentive for the VSS to manage and patrol the area. Thinning operations was done to increase the girth of and to raise the benefits from the plantation. 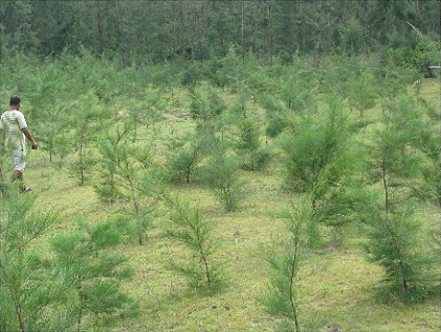 This also allows other species to grow with more light in the forest.